There's been plenty of word that the campfire that Sony is plotting a PlayStation Android phone, but in the meantime, we've been greeted with an official app for Android and iPhone. There's no gaming to be had hear, but you can keep track on your trophies and get the latest PS3 and PSP news direct from the source. What a year for the guys at Rovio! After a hugely successful iPhone launch, it followed up with Android, iPad and Nokia to become the top paid app in the world, with over 50 million downloads. In 2011, there's talk of an animated movie and plush toys. Our favourite has to be the festively-themed Angry Birds Seasons which opened up a new level for each day of Advent. Hands up who hasn't dreamed of shooting down TIE Fighters from the Millennium Falcon? Well now you can, with a little more reality than your average sim. 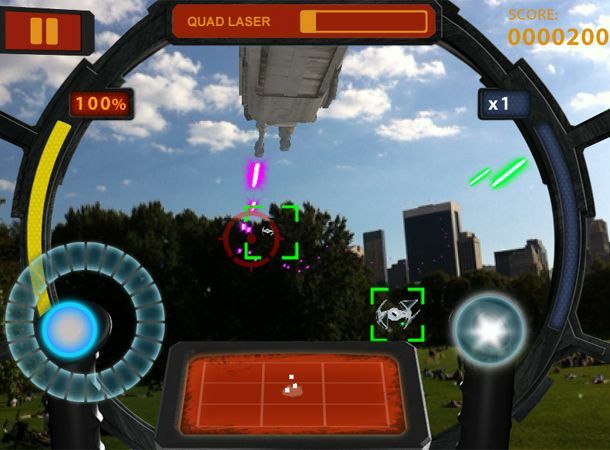 Star Wars Arcade: Falcon Gunner uses the iPhone's camera lens to stage the battlefield meaning the skyline of your hometown or the comfort of your living room. The iPhone game causing a stir around the world has gone big, gone HD, gone iPad. The launch of the iPad Edition has been a huge event for us at T3, giving a whole new lease of life to your favourite gadget magazine, with a host of interactive features and videos, bringing your favourite tech to life like never before. Download the January issue from the App Store today. Microsoft's new mobile OS has already delivered on its promise to bring a host of top games to the platform, via the Xbox Live portal. Earthworm Jim, old classic Monopoly and RPG The Harvest are all worth a download if you're handset is rocking the world's newest OS. The Android Market has been steadily improving throughout the back end of 2010, but Google's own stable of apps remain the most impressive. None more so than Google Translate, which can translate text and speak it back through your handset. It means you'll no longer go to Spain, speaking slowly and expecting people to understand. Well worth our coveted five star award. One of the first five star games for the iPhone, and it comes in the form of those ill-tempered winged creatures. Angry Brds HD for iPad translates gloriously from the iPhone and looks beautiful on the iPad's 9.7-inch screen. Definitely worth a punt.